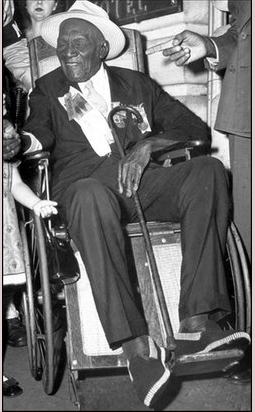 This is an unattributed photograph that purportedly shows Civil War veteran Joseph Clovese, who passed away at the age of 107 in 1951. For this 2013 Memorial Day, I want to give thanks and honor to the men and women who fought, died, and otherwise served in defense of our freedom and liberty. And I especially want to ackowledge the contributions of the African American soldiers and sailors who served in the armed forces during the American Civil War. I recently learned of the story of Joseph Clovese, which I am happy to share. Clovese may well have been the last surviving African American veteran of the Civil War. Reportedly, he passed away in July 1951 at the tender age of 107. He was born… on a plantation on January 30, 1844 in St. Bernard Parish, Louisiana. Though born a slave, he received a good education as a favorite house boy of his master. At age 17 he ran away to join nearby Union soldiers. He became a drummer boy during the siege of Vicksburg and later was enrolled in a regiment of “colored troops”. Following the war he worked on Mississippi river steamboats. He later worked on the crew stringing the first telegraph wires between New Orleans and Biloxi, Mississippi. Clovese was enlisted in the 63rd Regiment United States Colored Troops (USCT) Infantry, where his name is listed as Joseph Clovrse. For service information about the 63rd Regiment, look here. Once “Uncle Joe’s” presence was known, the community of Pontiac embraced him. Large gatherings were organized for his 105th, 106th and 107th birthdays. Joseph Clovese died at Dearborn Veterans hospital on July 13, 1951. More than 300 people were packed into the small Newman A.M.E. Church for the service. Hundreds more gathered at the grave site in Perry Mount Park cemetery. Oakland County Council of Veterans members served as pall bearers. A firing squad from Selfridge Air Force Base fired the final salute and taps was sounded over the cemetery. Thus, Clovese received a tribute befitting the Great Generation of black soldiers in the United States armed forces. I also want to give honor to my late uncle, Edward Cannon. He served in a segregated (African American) tank unit (761st Tank Battalion) under the command of General Patton. The unit was known as “the Black Panthers” based on their insignia. Rest in peace. This entry was posted in 20th Century, Civil War, Memorials and Monuments, Memory, Slavery, US Colored Troops and tagged African American Soldiers, civil war veteran, Colored Troops Veterans, GAR, Grand Army of the Republic, Joseph Clovese, USCI 63rd Regiment. Bookmark the permalink.